IN THE SUMMER of 1995, fans of Wycombe Wanderers picked up a copy of their local newspaper and saw the headline they’d been dreading for a long time. After five years at the helm, manager Martin O’Neill was leaving for Norwich. “I think the time may be right for both of us to part company in a reasonably amicable way before you totally and utterly get fed up with me,” he wrote in a farewell letter. There had been some spectacular highs – promotion to the Football League, three appearances at Wembley and the 1993 Conference and FA Trophy double. And O’Neill knew it too. Even while saying goodbye to fans, he couldn’t resist a less-than-subtle and completely unnecessary reminder of how far he’d brought the club. At least O’Neill acknowledged the lack of humility with his next line. The ego and insecurity have always led to issues and he’s never been one to take criticism particularly well. There’s the incredible story of O’Neill’s difficult relationship with Forest boss Allan Brown in the mid-70s. O’Neill believed there was no reason why he shouldn’t be playing in every game and regularly voiced his displeasure. When Harry Richards, the sports editor of the Nottingham Evening Post, chastised him for what he perceived as whingeing, O’Neill responded with a letter. Since I received a ‘letter’ from you, albeit through the Evening Post, I thought it proper that you should have a reply, so I shall not disappoint you.You claimed I made a ‘song and dance’ about a seemingly trifling affair, yet you found the matter sufficiently interesting to devote a column to it.What were you trying to tell me, Mr Richards? It is certainly your prerogative to criticise from the footballing aspect – although I wonder how many games you have seen this season – but I got the distinct impression from the tone of your article that my position in life prior to being with Nottingham Forest was in question.I am grateful to the club for giving me a chance, but I was ‘plucked’ from law studies at Queen’s University, Belfast, not from the queue at the Labour Exchange. To use your own words, Mr Richards, it’s a ‘cold, cruel world’. Brown only survived another year before Brian Clough arrived. But for all of the references to Clough that have been speckled throughout various O’Neill press conferences, the pair had a difficult relationship and – like with Brown – it seemed to revolve around the midfielder’s mouth. Certainly, O’Neill’s education and piercing intelligence irritated Clough, who likened him to James Joyce and not in a complimentary way. “Two Irishmen nobody could understand,” is how he famously described the similarities to journalist Duncan Hamilton, then the Forest reporter for the Post. There was also Clough’s relentless appreciation and adulation for left-winger John Robertson and, as a result, the intense focus on building attacks on that flank. It meant that O’Neill – even on the pitch – seemed isolated and frozen out much of the time. 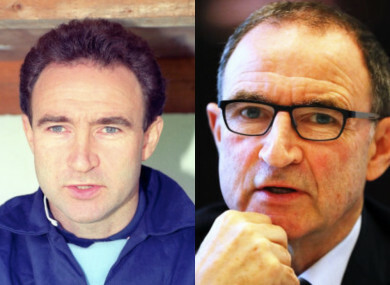 “I’m not sure Martin O’Neill always enjoyed himself at Forest, if I’m honest, because Clough would be the only person who could chop him down to size,” Daniel Taylor, author of I Believe In Miracles, told The42 back in 2015. Clough later admitted that he thought O’Neill was a ‘smart-arse’, though he valued him greatly as a player. Still, it’s hard not to look back at certain episodes as having been particularly unpleasant. When O’Neill scored twice in the 1978 Charity Shield against Ipswich, he was intent on tasting the thrill of a hat-trick. But Clough substituted him. It was difficult to ignore the likelihood of it being done purely out of spite and O’Neill always felt it was because of an innocuous incident in pre-season. Perhaps it was. But, maybe it was just another opportunity for Clough to put O’Neill in his place. It certainly didn’t help with O’Neill’s insecurity and he genuinely considered leaving the game completely. Instead, he remained with Forest and picked up a litany of silverware before the strained dynamic with Clough got too much. In May 1980, he pocketed a second European Cup medal but by January 1981, he’d handed in a transfer request and Clough had little hesitation in accepting and allowing O’Neill sign for Norwich. It said much that when O’Neill walked into Carrow Road as boss in 1995, he offered up a staggering comment. Across two spells, he made 75 appearances and won nothing. With Forest, he was there for a decade, became a league champion and twice won football’s greatest prize. It seemed he just couldn’t resist a dig at his former manager. O’Neill still enjoys throwing digs, particularly at those he felt undersold or under-appreciated him. He has been incredibly successful as a coach and the arrogance goes with the territory. But, in spite of all that success, he can still be immensely insecure. The questioning and criticism of whether he remains the right person to lead the Republic of Ireland is a perfectly natural process. And he knows that. He’s been there for five years and had his good days. But he’s aware that goldfish memories are an occupational hazard. And still, he can’t quite resist the digs. When Clough made them – and played up to that caricature – he could back everything up with results and success. But, as time went on and the frequency of his triumphs decreased, so too did his grandstanding and general superiority complex. In 1992, when Forest were at their lowest ebb under his management, he wasn’t bleating on about having won the European Cup twice. He wasn’t even mentioning how he’d brought the team to Wembley twice in the previous 12 months. There were still gags, still a sense of humour in there, but also the acknowledgement of how bad things were. “We’re at the bottom of the league because we’re crap,” he said. In O’Neill’s defence – the blend of ego and insecurity has been complemented by his terrific ability as a coach. But that’s never really been in question during his time with the Irish side. It’s more his ability to appreciate when things haven’t gone so well, understand why educated football people feel that way and why it makes perfect sense -as manager of the team – for him to get his fair share of the blame. However, the smugness isn’t a good look when so much negativity currently surrounds the Irish side. After the most recent defeat to Wales, he was asked about his team having managed one win from their last nine games. His immediate response was to point out that they’d lost just once from seven games directly before it. Again, it says much about his levels of self-worth that his first instinct is self-promotion. Like his statement to the Wycombe fans all those years ago, he just couldn’t let it slide. He couldn’t help pointing out – as if anyone has forgotten – that he’s a pretty decent manager. It’s been something similar regarding his constant battles with RTE soccer correspondent Tony O’Donoghue. After the scarring play-off thumping against Denmark, O’Neill – irritated by a question about how much of a humiliation it was – started listing off the Irish achievements during the group stage. And he held onto that exchange with O’Donoghue. Instead of dismissing it and moving on, he purposely held onto it so he could use it at the next available opportunity. And that came a few months later at the draw for the Uefa Nations League. “Just before we did our interview you actually said, ‘Hard luck’. What did you mean by that? You weren’t being disingenuous about it, were you?” O’Neill asked a bemused O’Donoghue. Later, quizzed on whether he had been tempted by interest from Premier League clubs, O’Neill never answered the question. Instead, he launched into a familiar tangent. He talked about getting through Euro qualifying, the play-offs and reaching the 2016 tournament. He moved himself closer to the microphone to emphasise how the team reached the World Cup play-offs despite being fourth seeds. And then things got very weird. “The perception (of his job as Irish boss) elsewhere is actually very, very, very positive – unlike yourself,” O’Neill said. When O’Donoghue countered that it wasn’t just his perception, O’Neill again referenced the pair’s interview from months earlier and claimed it was a ‘verbal attack’. “You also have to check my record at clubs,” he continued. And then he stormed off again. It was an entirely bizarre episode. O’Neill – openly discussing how in-demand and relevant he is – still seemed determined to run through his CV and talk up his success. Why? Why should he care what O’Donoghue thinks? Why should an interview from months earlier stay with him that much? Why should a two-word phrase uttered by O’Donoghue off-camera irritate him to such a degree? And it comes back to the insecurity that has followed him around for his entire career. One of Clough’s favourite pieces of music was an Irving Berlin song, made famous by Fred Astaire, the refrain of which references the inevitability of setback and despair and the importance of living life to the fullest right now. But, it’s also about the importance of facing up to reality. It’s time for O’Neill to face the music, regardless of his ego and his insecurity. Email “Ego and insecurity have followed Martin O'Neill around for his entire career”. Feedback on “Ego and insecurity have followed Martin O'Neill around for his entire career”.